Background: Depression is a serious mental ailment that is considered to be a global threat with an increased risk of prevalence. Drug development targeted against depression is an immense challenge as it encompasses multifaceted reasons with a poorly understood pathology along with the impediment of physiological blood brain barrier to the targeted site. 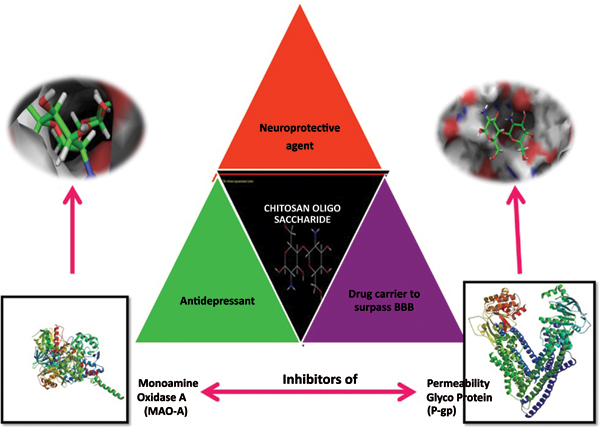 Monoamine inhibitors are attainable as antidepressants since it has pharmacological focus by considering monoamine oxidase-A (MAO-A) as potential drug targets against neurological ailments. Consequently, there is a sturdy constraint to formulate a brain drug that can decimate depression and surpass the physiological impediment to convalesce mental health. Objective: This study furnishes both in silico and in vitro analysis which intends the potentials of chitosan oligosaccharide lactate as an efficient monoamine-A inhibitor that can restrain the efflux transporter permeability glycoprotein (P-gp). Method: The activity of chitosan oligosaccharide lactate is evaluated by molecular docking assay which was substantiated by a cell line study. Results: The molecular docking assay against both the targeted proteins (MAO-A, P-gp) furnished a minimum binding affinity energy value of-9.341 and-7.326 kcal/mol. The activity of P-glycoprotein is evaluated by cell line studies which corroborated the inhibitory potential of chitosan oligosaccharide lactate by an increased potential of rhodamine transport assay when compared to the control. Conclusion: Chitosan oligosaccharides are derived from chemical hydrolysis of chitosan that ascertain itself as an efficient drug carrier with a significant ADMET score of low solubility and avoids the untargeted discharge of drug. The study bestows a two fold therapeutic efficacy of the polymer to establish itself as a proficient antidepressant that can channel across the blood brain barrier. Depression, monoamine oxidase-A, blood brain barrier, permeability glycoprotein chitosan oligosaccharide lactate, molecular docking.